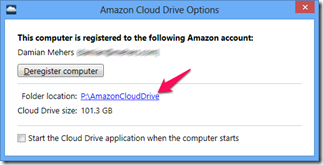 Amazon just released the first version of their Windows app to sync Amazon Cloud Drive. It’s very much a first version, with no ability to pause/resume sync, sync selective folders, or even (as far as I can see) a way of changing the default sync folder. When I displayed the options dialog, I assumed that all you had to do was click on the location to change it, but that simply opens the folder in the Explorer. It chose the smallest drive on my machine (of course), but I found a way to change it. Do this entirely at your own risk, and if you don’t know what this means, then don’t do it. You can use regedit to change the sync folder’s location, under "HKEY_CURRENT_USER\Software\Amazon\AmazonCloudDrive\SyncRoot" change “SyncRoot” to a different folder. Works for me, but no guarantees. This entry was posted in Fluff, Uncategorized on April 1, 2013 by damian. This worked great for me too! Thanks! Thanks for the tip. Working well! Thanks for this, it works ! Worked for me too cool tip thanks. Thanks for the great information, works fine! Nice one, thanks! Works a treat! What if I can´t find the SyncRoot key in my registry? Hi Olli, I’d suggest steering clear of using the Registry Editor if you are not familiar with it, since it is very easy to mess up a computer by accident by deleting/modifying the wrong thing. Hopefully Amazon will add a UI to do this soon. You should search for HKEY_CURRENT_USERSoftwareAmazonAmazonCloudDrive, so without the SyncRoot part. When it finds that, one of the keys in the list is the SyncRoot key. Thanks for the tip! Very useful information. Definitely a LIFESAVER here. IN addition, you have given me a new tool in my arsenal to fight against situations where the “Company” decides things cannot be fixed. 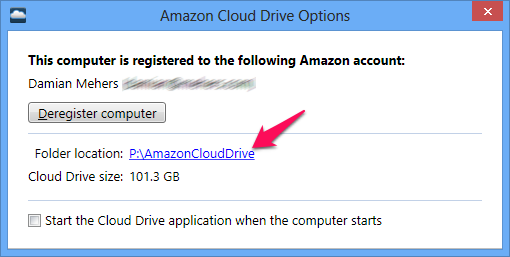 I find this MORONIC that Amazon feels it is adequate to place the Cloud dirve on the boot partition. All systems I build use a SSD for the boot volume, and that space is at a premium, although prices have been coming down as of late. Thanks for sharing that new json location in v4, it worked for me. Note the “\” to the special character “” in the json. Thank you, Simon. I spent 20 minutes poking through the registry trying to figure out where Amazon had moved the key. Instead of wasting more time, I scrolled down into the comments instead. Read the Whole F Manual – or at least the index – before getting started. Damian needs to update this article. Thank you Simon, great advice, worked on Win10! Muchas Gracias Simon, trabajó perfectamente! Simon, if I’ve understood this correctly I assume the json file needs to be edited to change the SyncPath to a new location. Is that correct? If so, how do I edit the json file? Right click and choose OPEN or double click the file. It will then say there are no programs to open this type of file. It should then ask if you want to open it with an installed program. Choose notepad. Then edit to hearts content. Thanks @Simon for the tip. No Amazon Drive folder in my registry, just Kindle. Reemphasizing Katrins comment: Did anyone find a solution on Mac?